If we wish to better understand the archaeology of today we need understand the archaeology of the past. We should understand the motives behind the research done to date and examine the motives for what we are doing now. This is extremely important when it comes to archaeology because archaeology by its very nature is a destructive science that if not well documented leads to the loss of valued information that can never be recovered. Knowing who worked here in the past and what their motives were will inevitably help us understand their research findings and enable us to build upon what has gone before rather than attempt to redo what may already exist in the archaeological record. It is for this purpose that a bibliography of the archaeological work of our predecessors may well prove useful. Archaeology in Huronia started over 150 years ago when the Jesuits returned to this area as part of the European settlement that had been making advance here since the 1830s. The Jesuits were in possession of the best documented early Canadian history that we have. This documentation of the European first contact with the First Nations of North America is largely contained within the Jesuit Relations and allied documents as well as the primary source records of ventures such as Champlain and Sagard. It is to these documents and writings that historians still look today for the rich records of Huronia’s early history. As the forensic scientists of history archaeologists attempt trace the footprints of the past and put together the puzzle left by the scattered artifacts left behind by earlier generations. Historical documentation, properly interpreted, can act as the picture on the cover of the jigsaw puzzle archaeologist are trying to put together. It was in the early1840s that we first witness efforts to unearth Huronia’s early history. With invaluable help of the Ducreux map insert of 1660 a number of Jesuit Fathers starting with P. Chazelle first attempted to identify the remnants of native villages and European influenced ruins and relics with the documentation found in the Jesuit Relation. Chazelle was shown the remain of a fishing village at the mouth of the Hogg River and attempt to identify it with that of St. Louis II where Brebeuf and Lalamount were capture in March of 1649. He went on to explore the Sturgeon River and canoed up the river with the help of some local Metis guides to a clearing that he surmised was the location of Ste Ignace II to which Brebeuf and Lalamond had been taken and executed. It was in 1844 that Chazelle came upon the ruins of what we now have confirmed to be Ste Marie I. 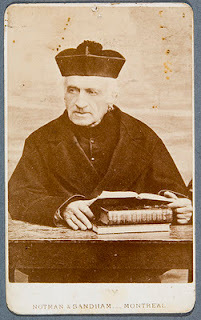 In 1855 Father Felix Martin was given the task by the government to explore and document the ruins of the Old Ford on the east bank of the Wye River. 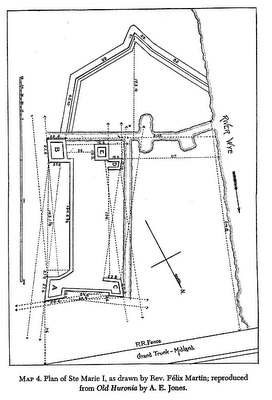 Father Martin was indeed able to trace the outline of the fort and further identified it as Ste Marie, the home of the Jesuit mission from 1639 to 1649 as described in the Jesuit Relations and as indicated on the Ducruex map. It was also Father Martin who first identified “The Fox Farm” (now known as the Bidmead site) as the location of Ste Ignace II. It was from this information that Dr Tache took note, examined the site and reported it as such to historian and author Frances Parkman. Although Parkman was a historian and not an archaeologist, it was his work “Jesuits in North America” that sparked great interest in the Jesuit Relations and the exciting but tragic story had played out in Huronia. Dr. Tache as noted corresponded with Parkman and sent him a map of sites native sites in Huronia. Other than what Parkman quotes of Tache’s little else can be found of Tache’s records and both data and artifact appear to be lost at present to the archaeological community. Dr Tache was associated with Laval University and it is assumed that the artifacts (including human remains and grave goods from 16 ossuaries Tache reports to have dug) were sent to Laval but to date no one has determined their current location. When we consider lost artifacts including human remains and burial goods there is Dr. Bawtree work can not go unnoticed. Dr Bawtree was a contemporary of Rev Chazelle. Both served the largely Ojibway population who had been moved from land at Coldwater to Beausoleil Island in the 1830s. Chazelle did so while ministering from his parish in Penetang and Bawtree was the attendance physician (on call) from his post at the Penetang Hospital. Bawtree is reported to have discovered and dug at least 5 ossuaries and sent the contents to a British Military museum outside of London. These artifacts also appear lost to the archaeological record. 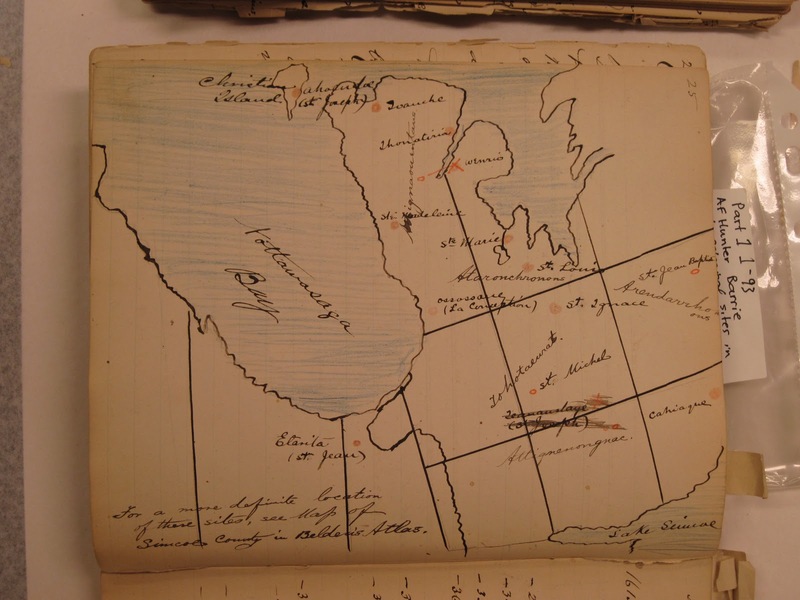 Andrew Hunter was the first to be commissioned to do a survey of native sites in Simcoe and although best know for his work “The History of Simcoe County” his “Notes on Sites of Huron Villages” is still used today as the bases for compiling archaeological site data bases for this area. These reports were commissioned and included as appendices to the reports to the Minister of Education for Ontario. Hunter produced reports for Tiny, Tay, Oro, Medonte, North Orillia, South Orillia, Vespra and Flos townships that include approximately 500 sites. Hunter’s work, while extensive, has been criticized by may later archaeologist as poorly documented and in some cases as hearsay because Hunter’s primary method of research was based on interviews with local residence and not always securing or verifying the evidence. This process took Hunter some 12 years and was mainly accomplished on bicycle. Hunter’s notes also appear frequently in the reports of the Provincial Museum (now the ROM) and many of the artifacts he collected were recorded in the collections of the museum. Arthur Edward Jones SJ is best known in the archaeological community for his work entitled “Old Huronia” otherwise knows as “Fifth Report of the Bureau of Archives for the Province of Ontario” published in 1908. As a contemporary of A F Hunter working in the same area these two men had several disagreements when it came to the interpretation of the relevant historical and archaeological data leading to what became competitive theories when it came to the identification of archaeological sites. 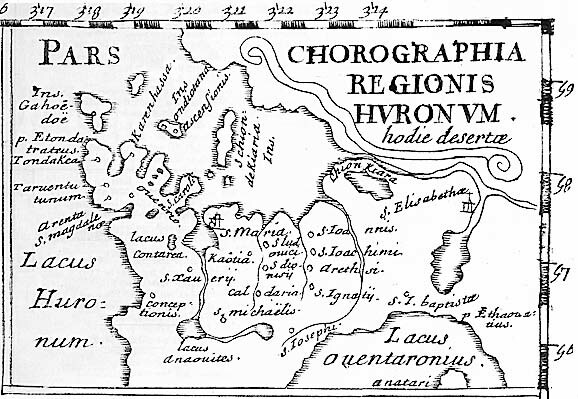 Jones was particularly interested in finding the Jesuit missions and locating the sites of martyrdom of the Catholic Saints who were executed in Huronia. Hunter on the other hand appears to have been somewhat more objective and interested in all Huron/Wendat/Jesuit sites in the area. 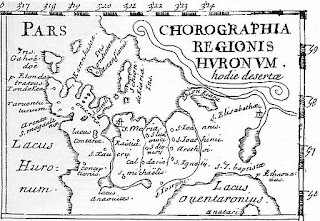 Both Jones and Hunter produced maps of their findings. In the 1940s we enter into an era of better trained, more academically qualified archaeologists who were the mentors of many of the senior archeologist of today. As in the past where we had competing theories between experts such as Jones and Hunter. This competition continued with people like Wilfred Jury and Kenneth Kidd. Kenneth Kidd was a meticulous academic who dedicated much of his carrier to Huronia and is best known here for his work on Ste Marie I and the Brebeuf ossuary in Tiny township. Despite his great attention to detail, some of his work was obviously ignored by other who did not wish to allow the time for such thorough investigation. Like A F Hunter, Kidd appears to maintained objectivity in his work and resisted the speculation that other would get caught up in and reflects in their work. Best known for his work on the reconstruction of Ste Marie and Discovery Harbour Wilf and Elsi Jury also did work and published reports on other well known sites such as Ste Louis, Ste Ignace and Toanche. Their work was well accepted at the time and resulted in extensive investment being made by the Province in the recreation of Ste Marie and Discovery Harbour as tourist attractions venues for educational field trips. Wilf Jury went on to become the founder of the London Museum of Archaeology as part of the University of Western Ontario. 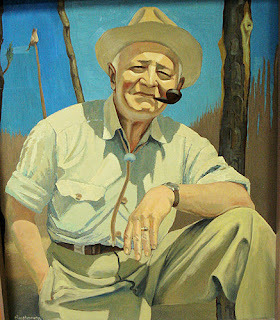 Frank Ridley (a summer resident of Tiny Township) was yet another dedicated archaeologist commissioned by the Minister of Education for the province of Ontario to survey the Huron/Wendat/Jesuit sites of Huronia. Ridley spent about the same time as A F Hunter (10 – 12 years) doing his research and preparing his reports (unpublished). While Ridley spent much of his time searching out Hunter site and verifying many of them he add a much needed site mapping to those he found and discovered others that were here to for unknown. 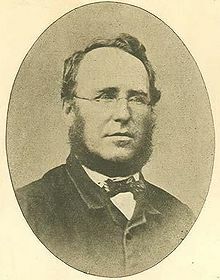 Since Ridley’s work, no further major surveys have been commissioned by the Province. Numerous smaller more specific surveys have been done related to highway development (J Hunter) and the establishment of Awenda Provincial Park (R O’Brian) to name a couple. Most of the archaeology conducted in recent years has been done by Consulting Archaeologists at the request of land developers who are required to do archaeological assessments under the Planning Act. Some work is also carried out by universities but these have been rare over the past number of years. This brief sketch of the history of archaeology in Huronia is a work in progress designed to illustrate the long history of archaeology in this region and acquaint those unfamiliar with some of the names and works they need become familiar with should they decide to place their trowel into the ground and discover more of what history lies buried in the earth beneath our feet.